Bluewater gets it: You are incredibly excited about the potential of your Cornerstone OnDemand solution. Why shouldn’t you be? Cornerstone serves tens of millions of people in almost 200 countries in 43 different languages. For 20 years, Cornerstone has provided its customers with a high-quality solution. That’s OK for starters. Now imagine taking Cornerstone farther. 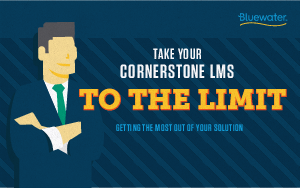 This e-book explains the challenges that most organizations face with Cornerstone, why they usually can’t overcome those limitations on their own, and how — with a little bit of the right kind of extra help — your Cornerstone Learning Management System (LMS) can help you accomplish so much more. It’s all about being ridiculously happy with your Cornerstone LMS.